The i-Frac lower completion ball drop sleeve system allows operators to bring wells in tight formations on line much more quickly than other methods. It allows for more than 20 sleeves per stage to be installed in a cemented liner and opened sequentially with a single ball. A number of stages can be run in a single well. The recent installation was in early paleocene and late cretaceous, carbonate formations in the Norwegian sector of the North Sea. 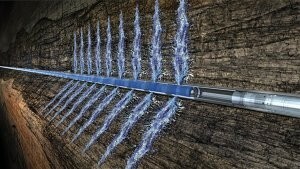 The technology also has huge potential for global shale oil and gas plays, where in some tight shale fields it could allow an operator to fracture twice as many wells in a year compared to traditional methods. The recovery of oil and gas in limestone and tight shale formations is accomplished by drilling horizontal wells to increase the well-reservoir contact. Each well is divided into zones which are individually opened to carry out a controlled and efficient stimulation of the formation rock. Traditionally, this has been a complex and time-consuming process involving the need for running perforation guns, plugs and stimulation equipment into and out of the well for each zone. Additionally, the use of explosive charges involves considerable risk. The use of i-TEC’s technology enables the well to be completed in a single, continuous process with the additional environmental benefit of a reduction in water use.